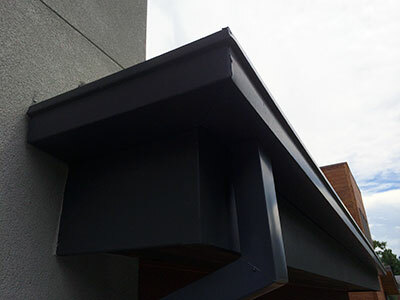 We are proud to introduce a revolution in box-style gutters for the contemporary or minimalist architect or homeowner. Our European Box Style Gutters are seamless, just like the rest of our state-of-the-art products, and serve as a modernistic alternative to K-style gutters. No other company has a seamless European Box Style Gutter. Nearly any style of home, from contemporary to international to New West, will look polished and modern with our Euro Box Style product as the finishing touch. Our seamless European Box Style Gutters come in two sizes for easy customization to any home or structure. Standard 5" - Perfect for most homes, this size can be compared to the 5" K-style gutters, yet are more modern, with greater linear appeal. Oversized 6" - More suited for larger homes and buildings, these hold the same modern, clean lines but with 20% greater capacity. European Box Style Gutters come in a variety of materials, including but not limited to the preferred Raw Mill-finished Galvalume. This style of gutter also comes in any of our standard colors to better fit your home or structure and add instant curb appeal. The Euro Box Style is also available in either the Premium Heavy Duty 24 Gauge or Standard Economy 26 Gauge, depending on builder preference. 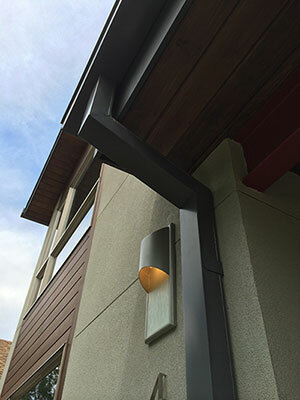 At Colorado Seamless Gutters, we aim to provide the look, feel, and functionality that your home or business deserves. Our seamless European Box Style Gutters are the absolute best choice for architects and builders who prefer clean lines, uncomplicated installation, and innovation.